Enjoy the extra privileges and peace of mind that come with our 26 m2 (280 sq ft) Executive room. Wide windows from the 12th or 13th floor look out onto Emirates Tower and pool or the World Trade Centre. 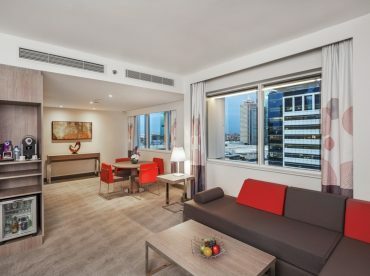 Our unique blend of exceptional service and sleek accommodation is why guests return again and again to Novotel World Trade Centre, Dubai. Click here to view the 360 virtual tour of the room.